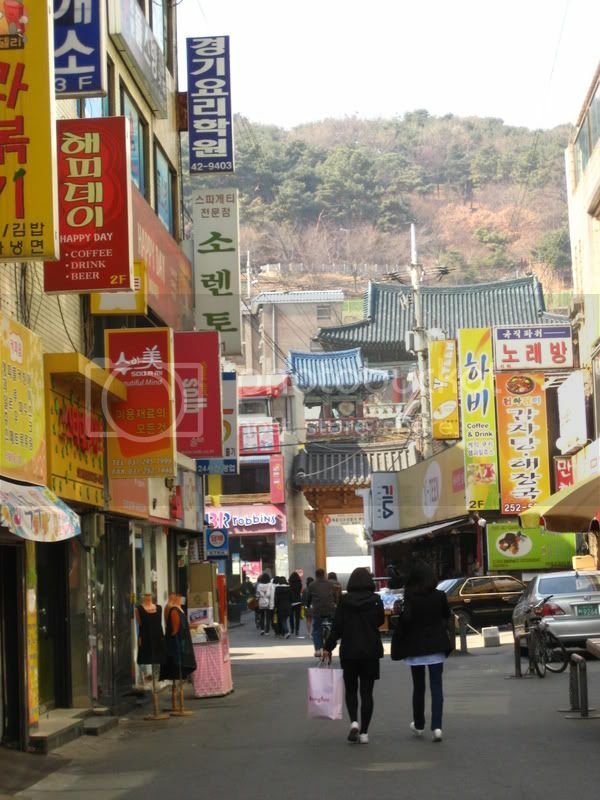 I don’t drive in Korea, but I do notice the street signs. 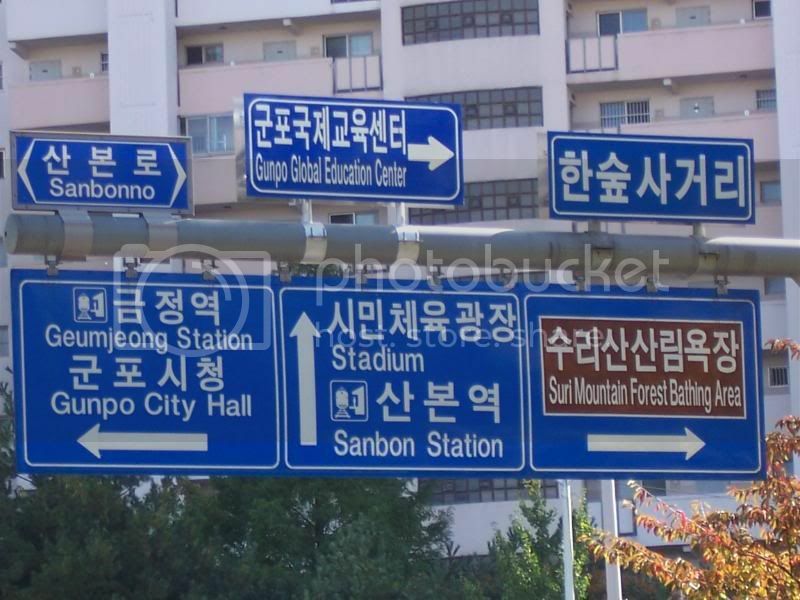 What’s weird is that the signs are situated in strange locations. Places that, if in America, drivers would be completely lost and constantly miss turns. There might be a sign that is after the turn, so if you’re not paying attention you miss the turn because the sign is ahead of the traffic and ahead of where you should have turned. Sometimes the sign is located WAY before the turn with maybe another road in between the sign and where you should actually turn. 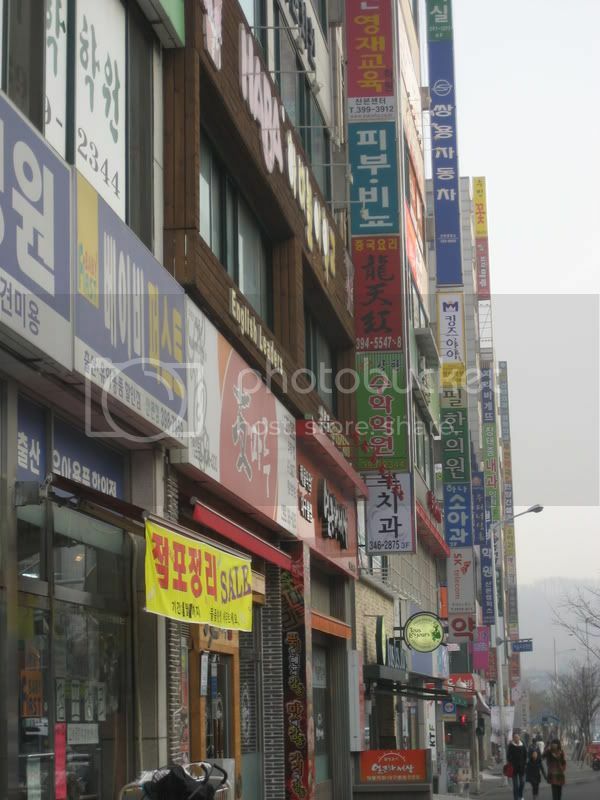 This top picture of signs for example is located smack dab in the middle of a 4-way traffic light. 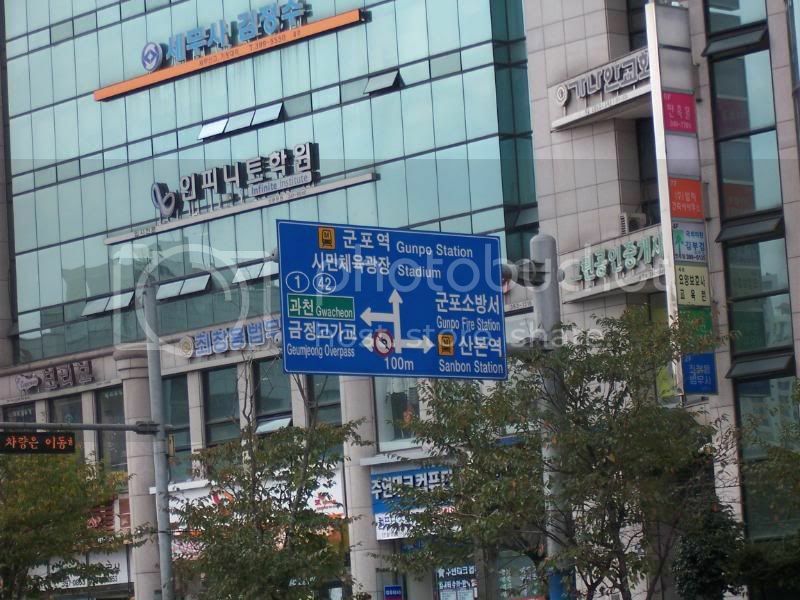 The top sign that says ‘Gunpo Global Education Center’ is not found by turning right at this intersection… it is down a few blocks. This led me to believe that signs found on top like this one imply not turning at this intersection, but at the next 1 or 2… that was wrong. Logic fail. Sometimes it does mean to turn immediately. Oh and there is only 1 sign at this intersection, only visible to the people driving head on. What about the other 3 lanes of traffic? Do they not need signs? I’m sure it makes perfect sense to Korean drivers. But how we’re supposed to just KNOW this, I’ll never understand. Chalk it up with the rest of the weirdness. This sign is placed in between two streets. As you can see, it has directions for what appears to be two different left turns up ahead. But notice the Do not Turn symbol pointing in the same direction as the road says to turn. Hmmm, which way do I go? This is near the fortress. It’s weird to see movies… English movies… with Korean titles. I know what it should be, but then the sign is something I don’t recognize. Seth took a picture of a wall covered in movie posters. This was in front of the DVD house. Let’s see… Hell boy, Hancock, Dark Knight, Golden Compass, Journey to the Center of the Earth, and I don’t remember the Ashton Kutcher movie. Of course, he centered stupid Nick Cage. Ewww. It’s raining here. Seth is supposed to meet up with some guys on Saturday to play music. So, that is great news. I hope it works out. Sometimes shopping on the roadside can be fun. 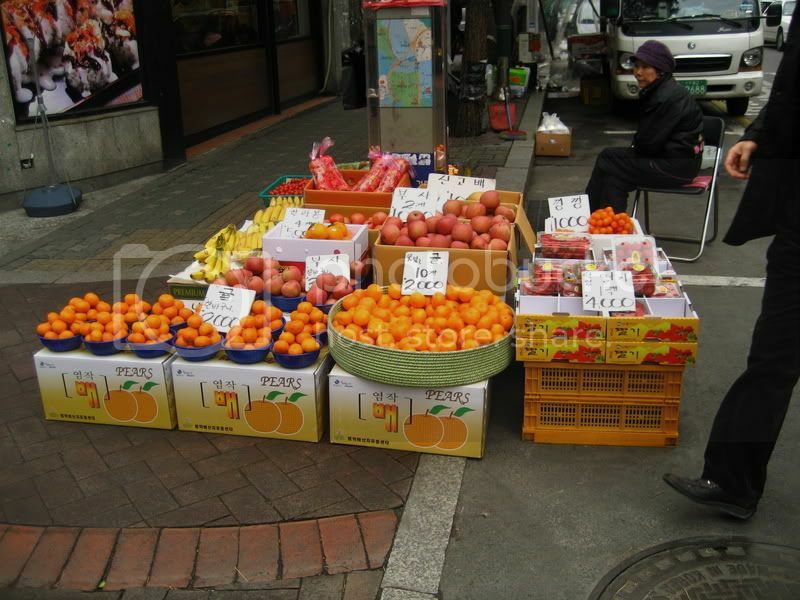 I love how people sell fresh fruit and veggies on the street. 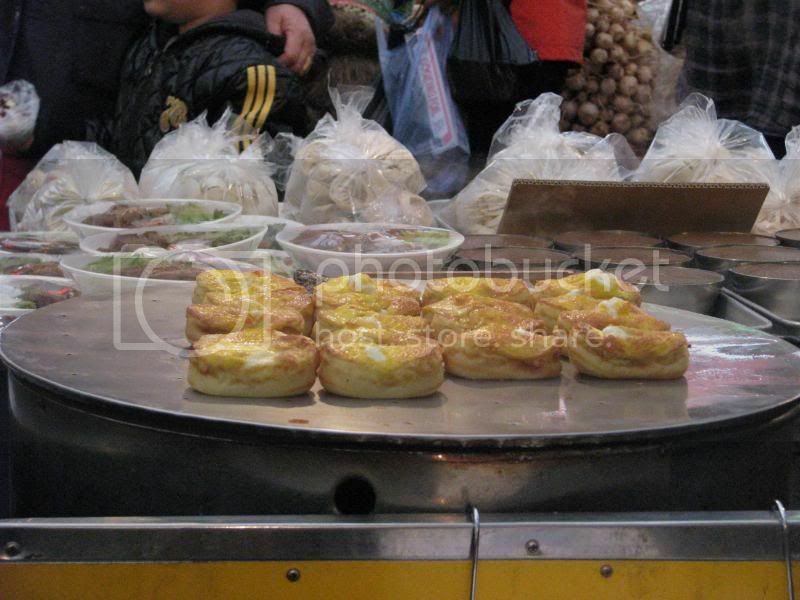 Obviously, they don’t only sell fresh food on the streets. Seth has gotten this (what he said was yummy) cornbread-like muffin with an egg cooked in the middle. 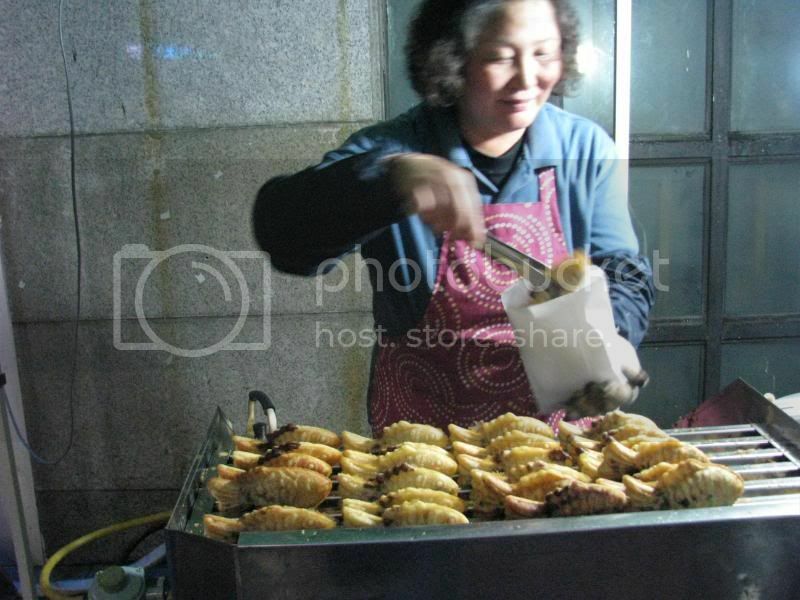 They also sell dumplings, called Mandu, out of small carts or trucks. If anyone buys mandu, your friends can get free broth… that works out well for me. Another big thing here is Waffles. People go crazy over waffles… almost like a belgian waffle. They eat them plain, covered in various fruits, or dipped in chocolate. But these things are everywhere. Seth and I ate the most amazing Tuna salad today for lunch. The fish is amazing over here… even the stuff in a can. Tonight we’re going to the Bacon place for dinner… again. Tuesdays (today) we don’t get off work until 10, and we’re usually too tired to actually cook food… and this place is on our way home… can’t help ourselves. I had a horrible headache yesterday, and thankfully today it is much better. 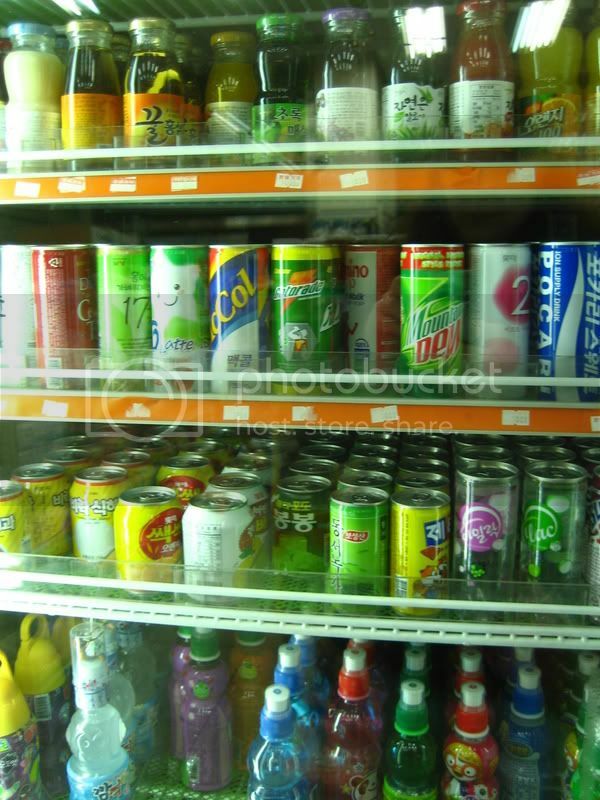 Even in the convenient stores, the rows of soda and juices are pretty. All the cans are about the size of regular Red Bull back home. Everything is colorful except for the clothing. Mostly, people wear black coats. A few of the children I teach have worn pink or red… but looking out my window right now, all I see are black coats walking around. Weird. It’s overcast today and a bit chilly, but feels good enough to be outside. Last night we went to this tiny Korean restaurant. Wooden tables and chairs lined the room. We were handed a peice of paper for us to write down our food choices… but we had to point to pictures on the wall just to order something. The food was good and really cheap. We’re trying to branch out of our comfort zone and try new things.